This Nebraska Month to Month Rental Agreement is for a month to month contract, to allow a Landlord to lease their property for residential purposes in Nebraska, where the lease renews every thirty days after the payment of rent. It follows Article 14 of the Uniform Residential Landlord Tenant Act Nebraska. The term of this lease will commence on a specific date and continue on a month-to-month basis until this agreement is terminated. The tenant will use the premises for residential purposes only and will not carry on any business in the premises. The residence has been inspected by the tenant or his/her agent and they are happy with the condition of the premises. The tenant has to specify the maximum number of people, which may reside at the said premises. The tenant and the landlord agree on a set amount of rent in US dollars, which will be paid in advance on the first day of every month. The rent will be paid either in the form of a check or money order and deliver that the landlord’s address. If the tenant is unable to pay the rent on the first day of the month, then he will have to pay late fees. If both the landlord and the tenant of the then the tenant has to pay a security deposit to the landlord. And if the tenant fully unfaithful completes the agreement and all of the terms mentioned in this agreement, then the deposit will be returned to the tenant after the end of the term of this agreement. If the tenant is unable to fulfil any of the terms and conditions of this rental agreement, then the landlord has the right to serve written seven days notice on the tenant and apply either physical or financial remedies to the tenant to recover any damages caused. The tenant will not be able to assign or sub lease the said premises without the written consent of the landlord. The landlord will have to deliver the possession of the premises that is being rented on the first day of the lease term. The tenant will have to pay charges for all utilities and services required on the premises as long as he is residing there. If the tenant wants to keep any pets on the premises, he will have to get the prior written permission of the landlord. The tenant will not keep any hazardous materials on the premises, will not perform any alterations and improvements, maintain and repair of the premises will not smoking the interior of the premises and will let the landlord and its agents inspect the premises at all the reasonable timings during the term of this agreement. 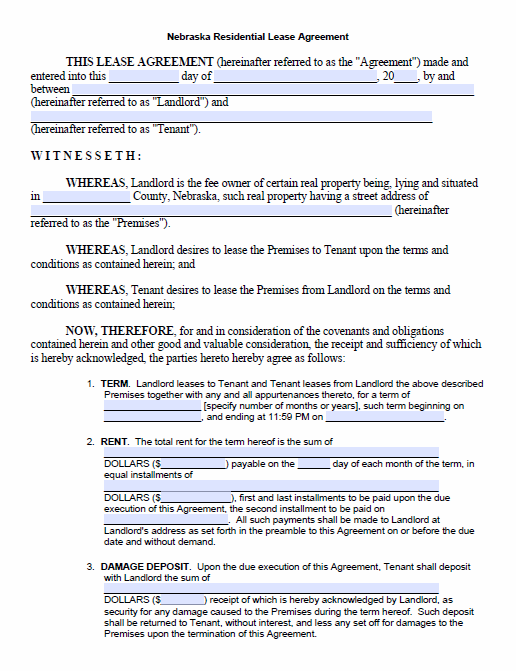 The rest of the terms and conditions of this document deal with abandonment of the premises by the tenant, extended absence of the tenant, security system, insurance, construction and Severability, any other additional terms and conditions that may apply, i.e. display of science, noise levels, parking spaces, use of balconies, locking of the entrance doors et cetera. There is ample space at the bottom of page 8 of this agreement to specify any other additional provisions or terms and conditions. Both the landlord and tenant both need to initial at the bottom right corner of each page of this agreement, and sign at the end of this agreement for this Nebraska month to month rental agreement to be legally executed. If you do not understand any of the terms and conditions of this agreement please seek legal advice. Download this template by clicking on the download link below.